This is the time of year where everything seems to get crazy for everyone. The kids have something big happening at school each week, holidays are upon us, and I have a pretty rigorous training schedule for some upcoming races. We are not in the season of making large elaborate meals every night. In fact, my meal plan lately is full of what I call "accountability dinners", or meals that are so simple to make that I HAVE to cook them, because there's no excuse when you can whip something up in 10 minutes. 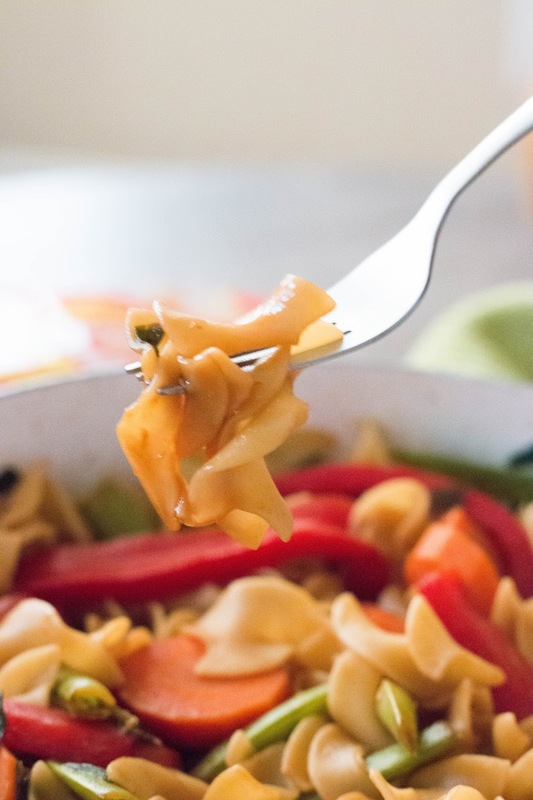 I came across this 10 Minute Stir-Fry recipe a couple weeks ago and thought that I could make it into an easy weeknight meal solution when paired with No Yolks Broad Noodles. 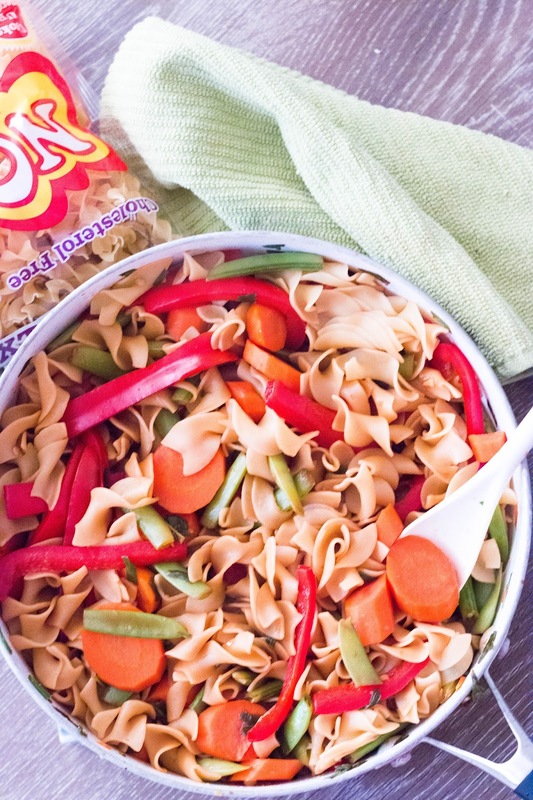 They're my go-to noodle for a lot of different recipes because they're so versatile. No Yolks can be added to an array of dishes from soups, casseroles, and even new and unexpected dishes like Asian inspired stir-frys. 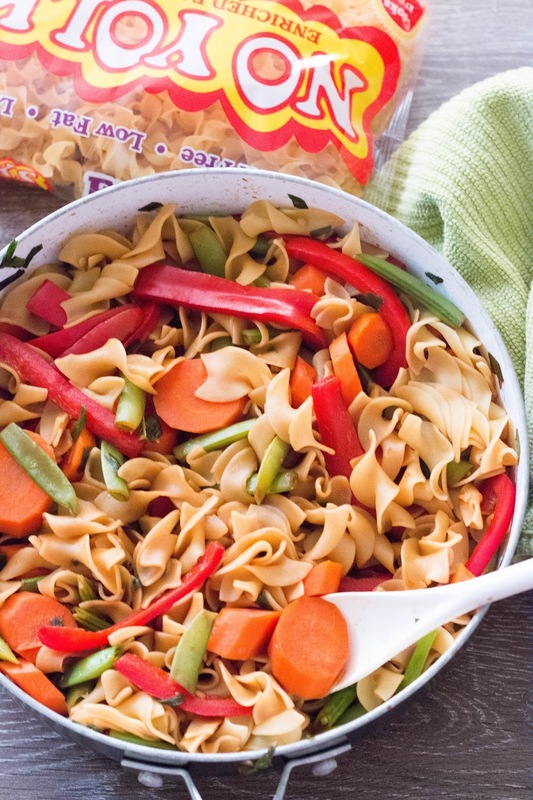 Plus, they're a healthy egg noodle alternative since they're made from egg whites only, and have no cholesterol and are low in fat and sodium. No Yolks have lots of different noodles from Borad, to Extra Broad, fine, kluski, dumplings, and even stir-fry! There is a noodle out there for every person and preference. For this recipe I simply made the sauce and veggies in one pot, while the No Yolks Broad noodles cooked away in the other. When both pots were done cooking I drained the noodles, tossed them in with the other, and dinner was complete! Cook noodles according to package instructions. When the noodles are done cooking, drain well, and set aside. While the noodles are cooking, in a large skillet heat up the oil over medium high heat, and cook the ginger and scallions for 30 seconds. Add bell peppers and carrots and cook for 3 minutes. Add snow peas and cook for an additional 30 seconds. Stir in broth and soy sauce. Bring to a boil and stir constantly for 3-4 minutes, until sauce is thickened. Add noodles, stir until well mixed, serve immediately. Be sure to head on over to No Yolks site, for more dinner ideas and inspiration. I never cook because I am always super afraid it is going to take me ages to come up with something decent. This looks super delicious and super quick to do! so a must-try! YUM YUM! I make something similar with rice and throw in some sweet and sour to cut against the soy but have NEVER tried with egg noodles. Looks great! I am all over this, straight into my foodie book marks it went. I am always looking for variation through the week and sometimes I don't have time to let something sit and develope. I LOVE the sound of this meal, I can't wait to give it a go! OMG, that looks legit delicious! I'm definitely making that this week. Love everything stir-fry. I love No Yolk egg noodles! I usually add hamburger or kielbasa to them. Or just add garlic & onion salt & eat them. It's so great to have quick, easy recipes like this. This almost looks like something that I would make because I love coming up with different ideas to spice up pasta. Looks great. This looks gorgeous treat for a cold weekday evening when you need a quick fix for your dinner. Looking full of flavours. Yes! 10 minutes and it's on the plate! Why didn't I think of this. It sounds delicious, too, but I would sub veggie broth for the chicken broth in mine. This looks delicious and so easy! 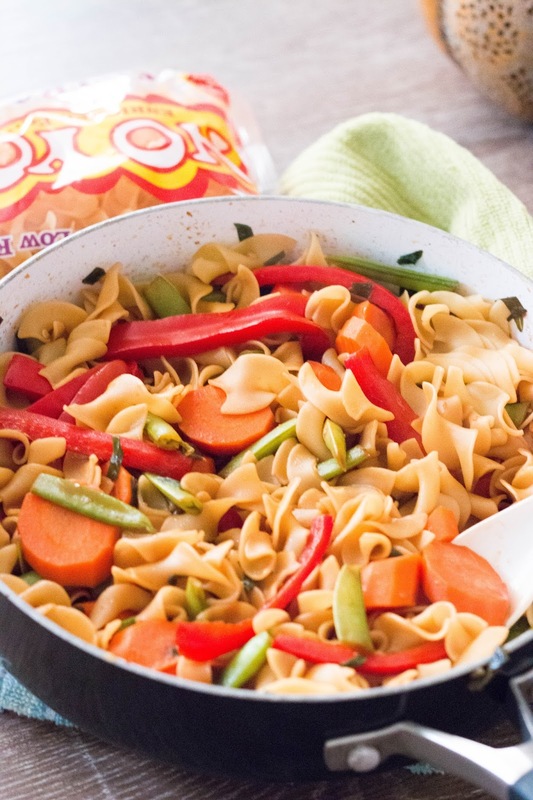 We love stir fry and pasta dishes so this would be a win! I"m trying to get more inspired for fall cooking. Thanks for the dinner idea! I'm always looking for a quick and easy yummy recipe like this. This Cheesy Taco Mac looks amazing and yummy, I will definitely check and try this recipe. This looks so delicious, being a working mom, I usually reach out for quick and healthy recipes. I love noodles and I am going to check these next time I am in store. This is my kind of recipe. I will definitelt try this cheesy taco mac this weekend. I bet my family would love these for sure. This looks delicious. I love that this recipe is quick but still healthy. I will make sure to share this post with others. This is definitely something I would whip up on a busy day. Love that it is quick and easy. YUM YUM! Love that it is quick and easy. I love that this recipe is quick but still healthy. This cheesy taco mac looks so delicious and really tempting. I am always looking for an easy and quick recipe. I will definitely try this one. I love things that are easy to make and I also love Asian food. This looks wonderful! I love how easy it is to just combine the two after they are done cooking. Wow!! This article is really on time. I am looking for an easy and quick recipe this fall season. I will definitely try this cheesy taco mac. That looks really good! With my busy schedule, I love cooking meals that are quick and delicious! Side note, these were my favorite noodles as a kid! I loved eating them with just soy sauce! looks delicious .also it wont take much time to cook which is perfect for those who have busy schedules. mm that looks great.. delicious and so easy to make too. perfect.